Feeling froggy today and wanted to make something. 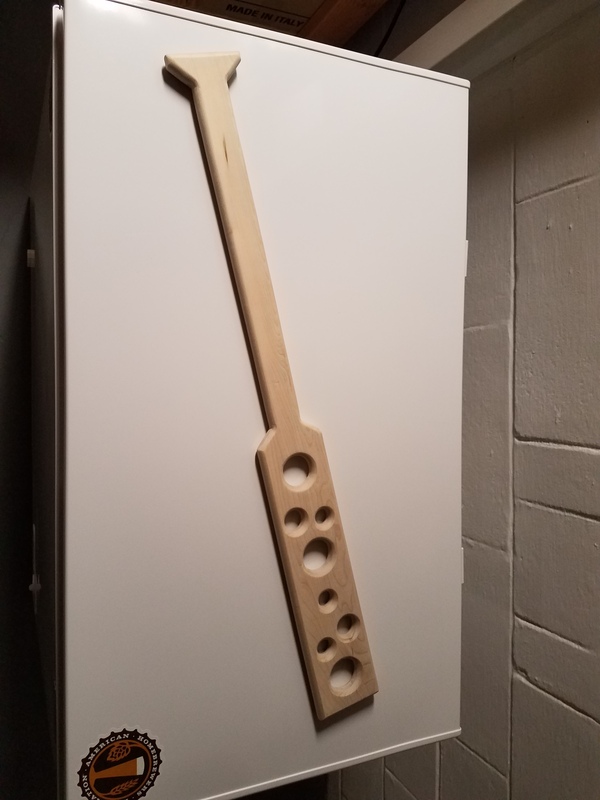 Went to HD picked up a piece of maple and made a mash paddle. Nothing crazy just a few different sized holes and rounded all the edges. Need someone who can burn my last name into the handle. Do the big holes hold tasters and the small ones hold shots? Looks familiar.....I had a few of those applied to the seat of my pants in junior high!! Ah, the good old days of corporal punishment! Haha I was too young. I've only heard storys and seen it in a movie or two. That looks great. Nice work. Now that I saw this, I think I might build my own. Do you mind sharing the dimensions and any pointers? How thick of a piece of maple? The maple board was from HD it was a 1"x4" which is actually 3/4" x 3 1/2". I think I made it 32" long. I tried to use a jig saw but it was super hard to get a straight cut without the blade deflecting. So I ended up plunge cutting it with a 6 1/2" circular saw and just making small cuts with the jig saw to finish. Then I routed all the edges, made some random holes and sanded it a bunch.